Whether you’re thinking of acquiring a special piece of land on which to build your dream home, already live with a large garden that you reckon would make an ideal location for a new build house or bungalow or are lucky enough to have a plot of land that’s been in the family for generations, Ecclesall Design will be there to guide you with professional advice and inspirational designs to add value and create a lovely home that can be as traditional or as contemporary as you like. Larger-scale development is also no problem for the team at Ecclesall Design. 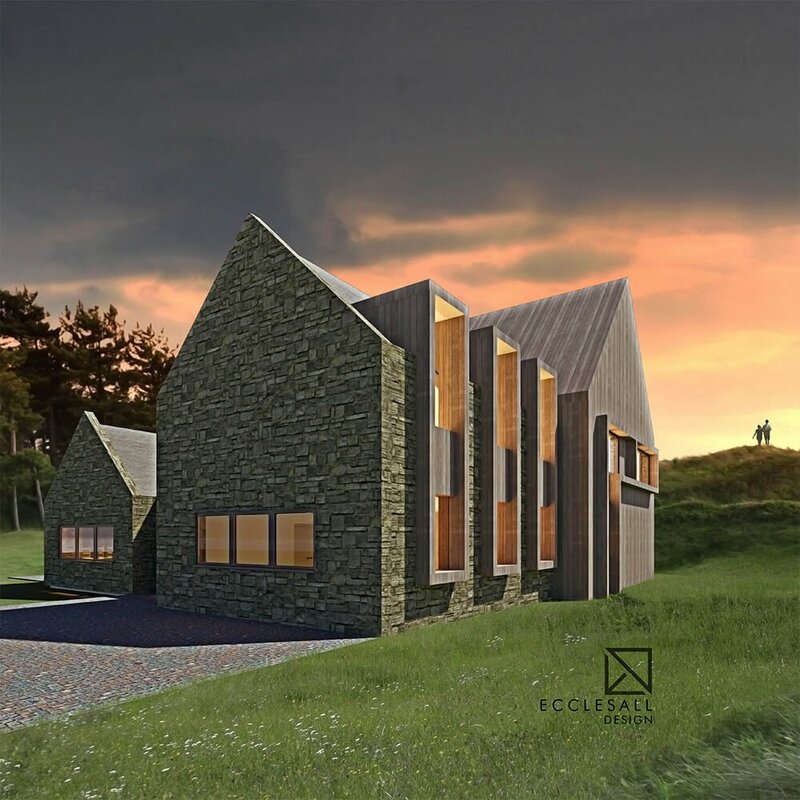 For example, amongst the projects we have worked on is a local site which now has planning permission for 13 4- and 5-bed luxury detached houses as well as a new road and off-site drainage. There is no denying that good design will add value to your finished property as well as making a warm, comfortable place to live. Sometimes clients when they first approach us are looking for imagination and creativity, in which case we’ll offer a range of options after a detailed consultation during which we aim to get a feel for what will be most pleasing to you and your family. Other clients may have their ideas already sketched out in some detail and just want us to bring it all to life in which case we’ll fine-tune the details using our expertise and knowledge to make suggestions. Whichever approach works for you, our job is to create drawings for a welcoming home that maximises space and light bearing in mind the constraints (or opportunities) of the land itself, suggesting alternative or sustainable materials, finishes and fittings should you so wish, with an eye to sustainability and the cost of not only constructing the new build house but the long term implications too. 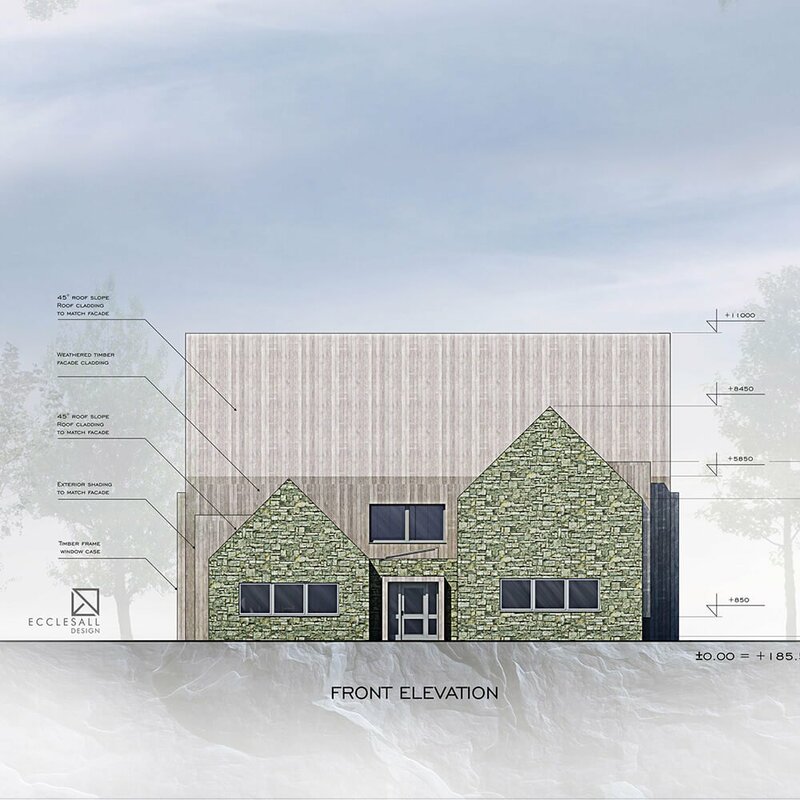 We would always recommend a topographical survey as this establishes accuracy for the proposed property location and enables us to produce CGIs (Computer Generated Images) to show you, your neighbours and the Planning authority how the new building is intended to look in its new location. If we are planning for a number of properties we will take into account how the proposed new road, if necessary, would impact on the local highway. It’s important to take into account how the sun will impact on the building – creating light sunny rooms wherever possible is a priority of our designers so we take careful note of the orientation of each property and any shade cast by nearby houses or large trees. Flood reports will sometimes be necessary. You’ll already know whether you live on a hill – in which case a flood report won’t be needed – but we’ll take advice from the Environment Agency as to the chances of the property being affected by adverse weather conditions in the future and will advise you – and obtain the report on your behalf – if the Planning Authority will require it as part of the application. We’ll also make sure that we design the property appropriately to minimise the possibility of flood damage if you are in a high-risk zone. The land might be subject to a restrictive covenant or have a Right of Way running over it. Even if all appears hopeless to you – perhaps the neighbours have told you there’s no chance of you getting Planning Permission – we will look at the issues and give you informed advice. It might be that we recommend you consult a specialist Land Law Solicitor; we can recommend an excellent solicitor who practises in this area and who has obtained great results for some of our clients. A Right of Way can sometimes be relocated or even removed completely, subject to the prevailing circumstances. Let us advise you! We can if you wish investigate the surrounding Land Registry Titles to make sure your proposed development site isn’t going to be subject to a Ransom Strip as soon as you get the precious Planning Permission. A Ransom Strip is where an adjoining land owner owns a piece of land – it can be as little as an inch! – over which you cannot pass without their permission. Or rather, without paying them a substantial amount of money. This really matters if their land is the only thing between you and the Highway. We can advise you how to approach the negotiation. Planning Applications for new build houses and other properties in Conservation Areas will probably be subject to delicate negotiations with the Planners but we are accustomed to dealing with the Local Planning Authority, appreciate their concerns and will propose designs that will enhance and complement the surrounding neighbourhood. 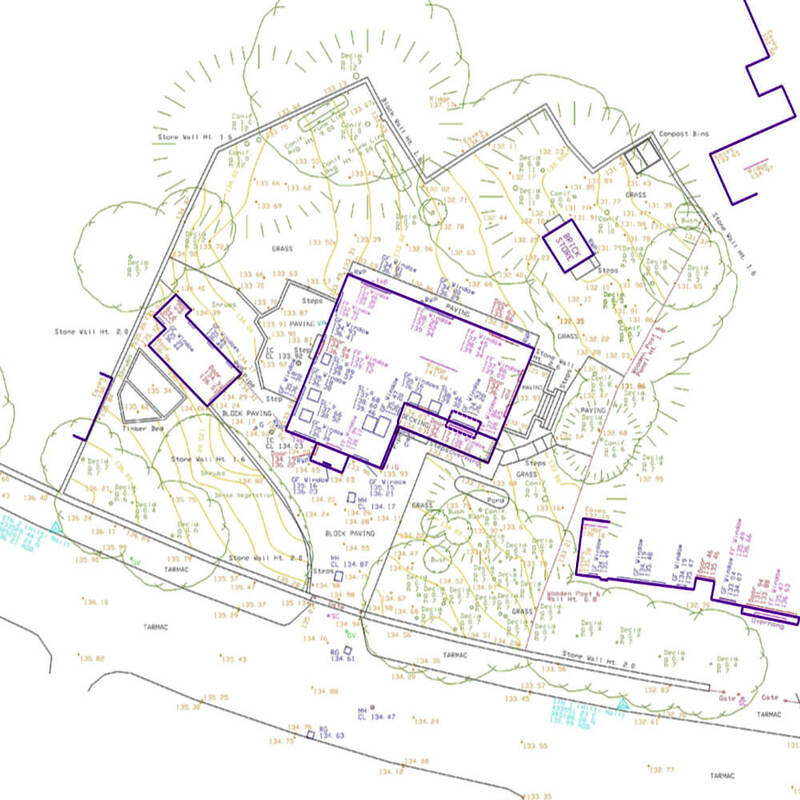 Once we have the accurate topographical survey, we input that information into our CAD software. This enables us to start to see how your new property will sit on the land. From a planning point of view, this is what they’re interested in. It’s all about appearances, and the footprint. However, what you really care about is how this new build house will be lived in. Whether the new build property (or properties) is where you’re going to live, or whether you’re doing this as an investment property/ies, what ultimately matters is the pleasure it brings to the occupants. It doesn’t matter if that’s going to be your family or a future home-owner purchasing your investment, it is important that the new property brings joy and pleasure to those who are going to live in it. The fee we quote is the price you pay. No matter how many alterations you make, our price doesn’t change. Sure, we’d make more money if we charged you an hourly rate for amendments. But our company ethos is that we want our clients to be happy. We take pride in our reputation. With a new build property, we’d always recommend a Pre-application Enquiry. This buys you a certain amount of time of a Planning Officer’s expertise. Their comments are invaluable. If you are interested in quotations from builders, our full plans will enable you to obtain comparative quotes. Our new build properties are designed using 3D drawings. You’ll find plenty of architects who still only offer the old-fashioned traditional 2D line drawing service but our modern 3D service allows you – and other interested parties – to fully appreciate every detail of the architectural design so you really can expect to get exactly the finished new build house that you hoped for. During the Pre-application process we will coordinate with the allocated planning officer on your behalf, and will make alterations to the designs in conjunction with our client and the planning officer. Once we receive the written report from the planning officer we prepare the final drawings and will discuss with our client any additional reports suggested by the planning officer. We will make the planning application on your behalf, along with a Design and Access Statement. 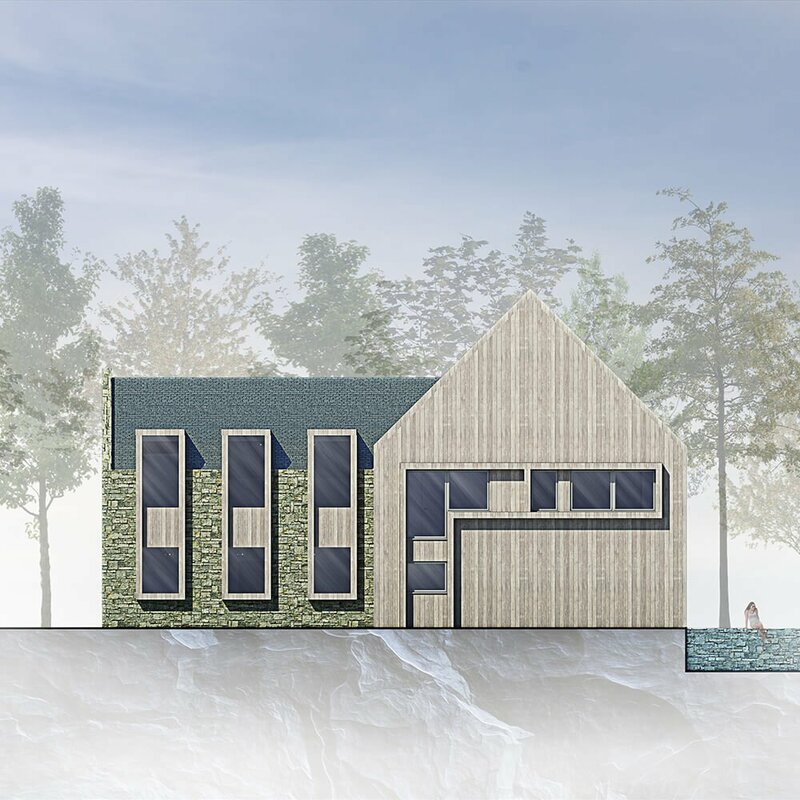 Sometimes we might recommend that a planning consultant be engaged to prepare the Design and Access Statement depending on the feed back from the Pre-application Enquiry. We will discuss the pros and cons of this when the time comes. The planning process generally takes eight weeks. The first four weeks are taken up with the consultation period, which is when your neighbours will receive letters advising them of the intended development and offering them the opportunity to contact the planning authority if they choose to. Other consultees such as Highways and the Conservation Area team will also be asked to comment on the application. Once the consultation period is completed the allocated planning officer will consider any responses that have been received and will visit the site to form their own opinion. We may be asked to make some minor amendment at this stage or it may be accepted without alteration. The planning officer will write a report and a Planning Notice will then be issued. It is at this point that planning permission is granted. The next stage would usually be to prepare Building Regulation details which are needed to ensure that the build is completed in accordance with current Building Regulations. Once the planning application is granted we can help you bring your project to real life. We offer project management services that would coordinate all the required professionals that need to be involved before the construction work starts. We are happy to recommend local builders that provide quality construction services so you can obtain competitive quotes and make an informed decision. Before the construction work starts we can provide Building Regulations if required. Building a house is an exciting event in everyone’s life. We can help you create the one that truly feels like home. Get in touch and let’s get your project started!